Well the experimentation continues with my new SLR camera. These Gerbera (related to sunflowers and daisies, I believe) are in big pots on our deck and front porch and kept calling my name to have their portraits taken. 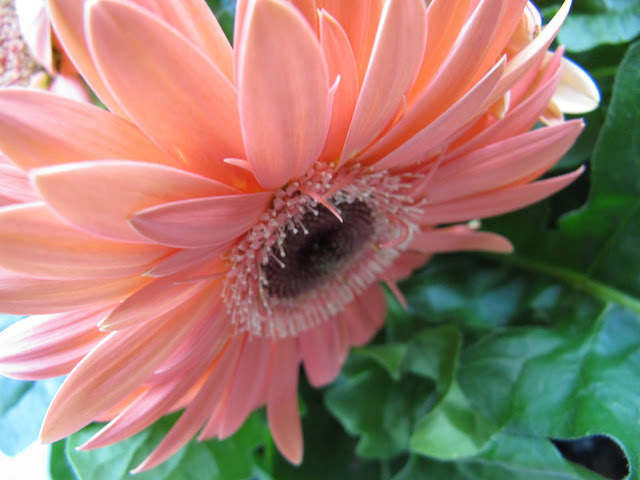 The first two photographs were taken with my Canon point and shoot PowerShot SX200 IS on a macro setting. The new SLR was used to take the rest of the pics - with a macro lens. None of them have been edited in any way except for cropping. 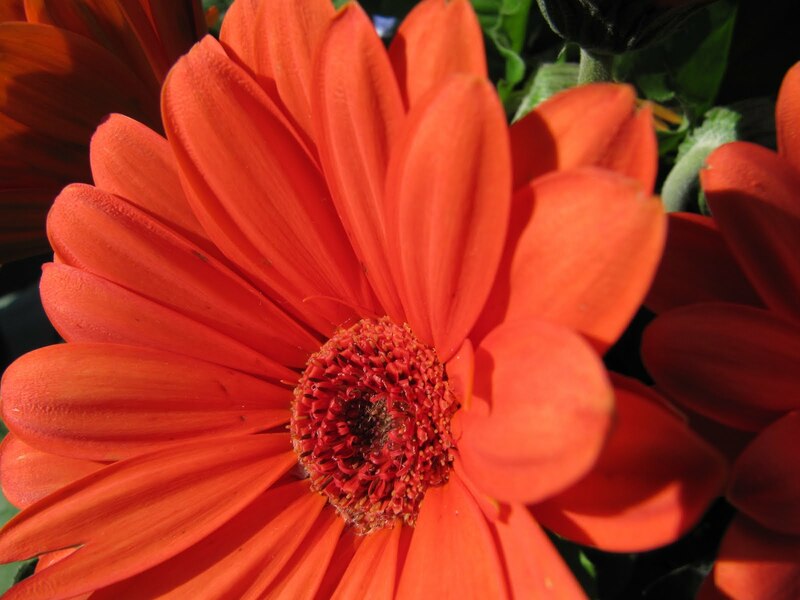 Gerbera come in a range of colours, some of them extremely vibrant and intense. 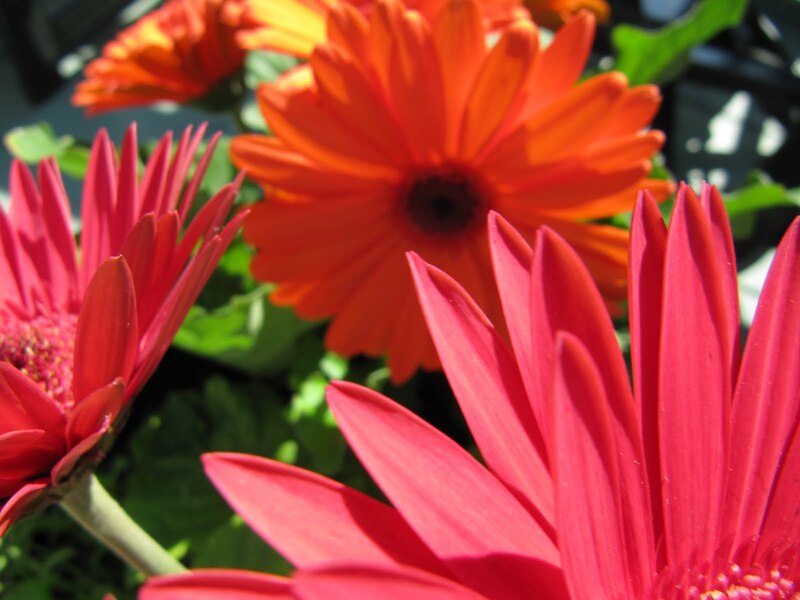 Most of the pots have bright orange and pink Gerbera with perwinkle blue trailing lobelia (the lobelia has been cropped out of the shots). A couple of the pots have pale, peachy gerbera for a much softer effect. Thanks again dear peeps for all your good tips and words of support. 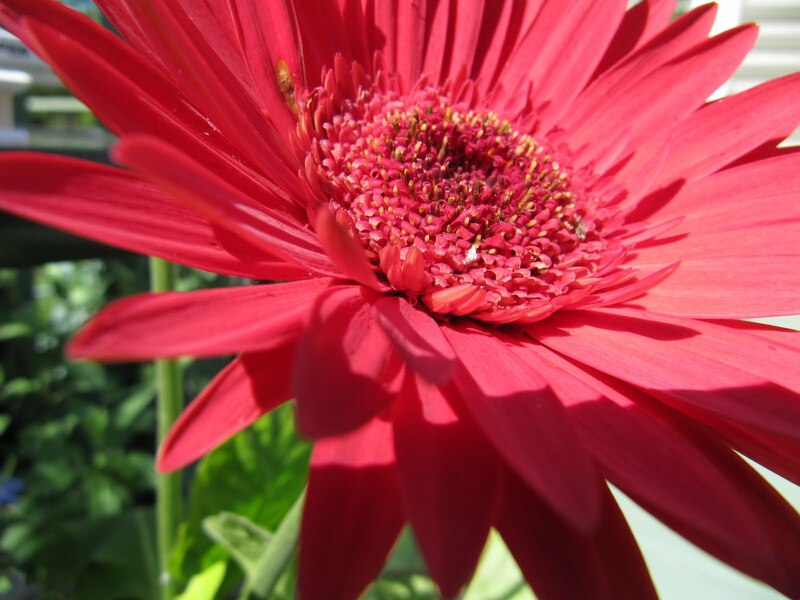 I promise this blog will be a flower-free zone for the next few posts! Bonnie the flowers are beautiful, such vibrant colors. a nice end to my day. take care. I would not notice the difference if it wasn't side-by-side, sort of. Much clearer with the new camera. The flowers are beautiful and I wouldn't mind more of them. Can you tell me what a macro lens is? I feel like an idiot, but I don't know. I get close in, adjust my focus and take the photo. I had to add this... my word verification was 'jailer'. REALLY! You're getting some beautiful, vibrant colours. Lovely. 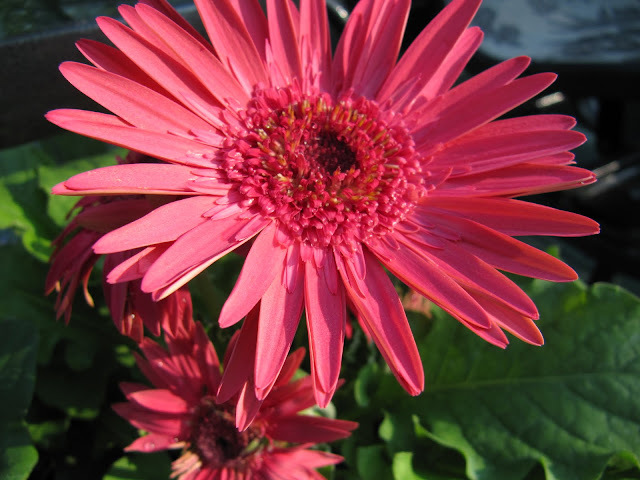 One of my favorite flowers! Don't they come in a stunning array of colors? This year I have several pots of bright yellow ones. Unfortunately, the local goldfinches love to pull off the petals and throw them to the ground. I'm not sure if it's a mating ritual or if they're trying to make them go to seed. I'm quite annoyed with the little buggers, though. Wow. Stunning photos. I'm glad I'm not trying to make a living as a photographer; these days amateurs do such amazing work. 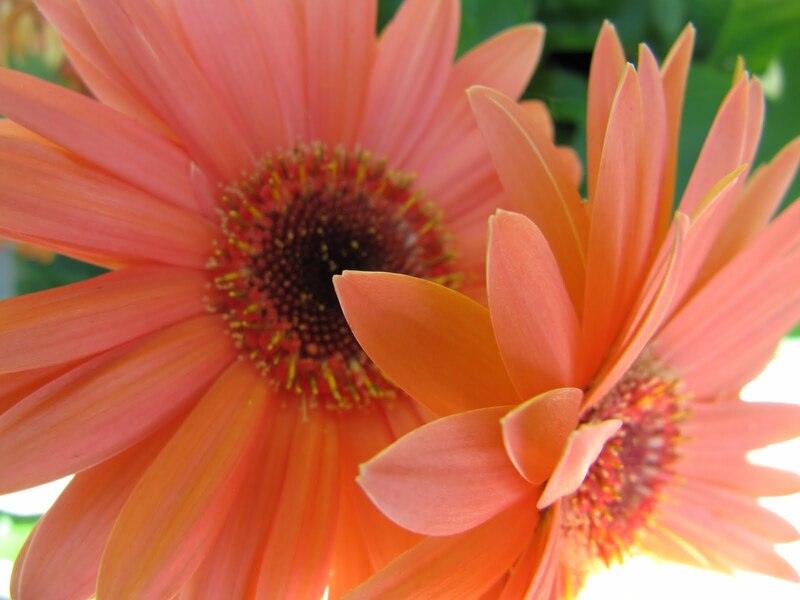 My hairdresser is marrying on Saturday and is having gerberas for her wedding bouquet as she wants it to be fun and vibrant. I am looking forward to seeing the jolly colours. We can buy them here in shops (florists) and they last well in water but I don;t think we can grow them. Oh I am loving the flowers...please keep them coming. And your photos are amazing. I love everything about them!!! 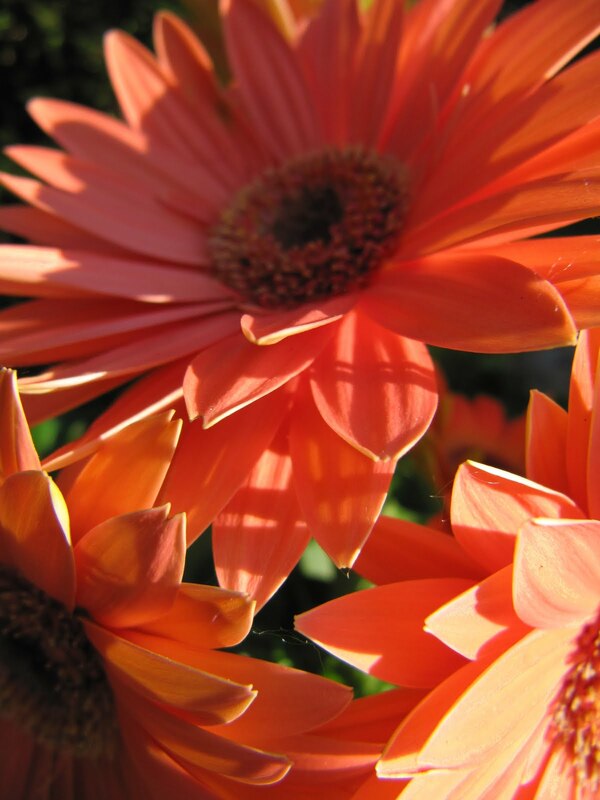 Lovely Gerbera. You are getting there! What fun it must be to be playing with your cameras. Enjoy yourself! Love the flowers. I'm sticking with my Nikon compact--no courage to take on an SLR. Does it have image stabilization? That is always my greatest challenge. Photoshop makes my pictures better. I like compacts because they fit well in purses. magnificent shots, bonnie!!! the colors are absolutely beautiful!!! great great work!